You are probably having trouble playing Guild Wars with your gamepad or joystick. 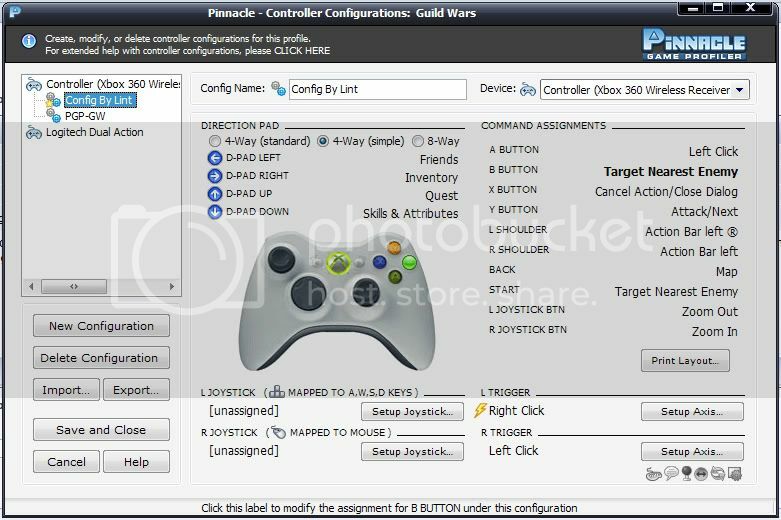 a pre-made profile for Guild Wars controller support. Simple. My Attempt at a Guild Wars profile for the XBOX 360 controller. Its more of a edited version of a profile already on here, i would credit them here but i can't remember who's. If anyone wants to be a friend on Guild Wars please feel free to PM me here. Yea, I know what your thinking... That would be uncomfortable to play with a 360. But the thing is, It really isn't. This is by far one of the most unique configurations I've ever seen. This was made by me. Next select "Edit Configuration." Import my configuration found below. Enjoy! This is what Makes this unique. When you hit L Button Action Bar once, it will goto skill 1. In order to activate it press A or left tigger. Press it again then it will goto skill two. Again then skill 3 and so on. Press R Button Action Bar once, it will go back one. This makes it so much more comfortable to play. Well, I hope you guys like it! Enjoy! Well I finally got a free trial for Guild Wars, and I made up what I think is probably a pretty good profile... but right after I finished my profile and started getting the hang of the game... my Guild Wars trial expired... so I didn't get to test this as well as I would have liked. Anyway, I would REALLY APPRECIATE some feedback from some Guild Wars players to let me know if the profile works well and if they would make any improvements then please suggest them. Since this game uses a "hold right mouse button and move mouse" style of camera movement, yet the mouse is still needed to click around in the world, I decided a "toggle free look" method was the best where you press a button (R SHOULDER) to toggle between moving the mouse and turning the camera. Please let me know how this works for you. Also I have a shift button (L SHOULDER) that when held allows the DPAD and 4 face buttons to trigger SKILLS 1-8, but as I mentioned above, I really didn't get too far in the game before I wasn't allowed to play anymore. But some other users had created profiles that use this sort of "shift for skills" kind of setup, so I figured I would do the same. So please post your feedback about what you like and don't like about this profile so I can improve it if neccessary. Thanks! I've been using this profile for awhile now, but just haven't got around to posting it. I found that it takes a few hours to get completely used to, but once you are, your battle movements and skill uses are fairly quick (which is importnat when playing a game where you advance using your skill instead of just battle experience). This one is fairly complex. To make things easy, you will need two config files. All of the other controls apply to both Configs. You can of course configure the two Configs however you like, but I find this to be easiest, still takes a little getting used to, but it gets comfortable easily.